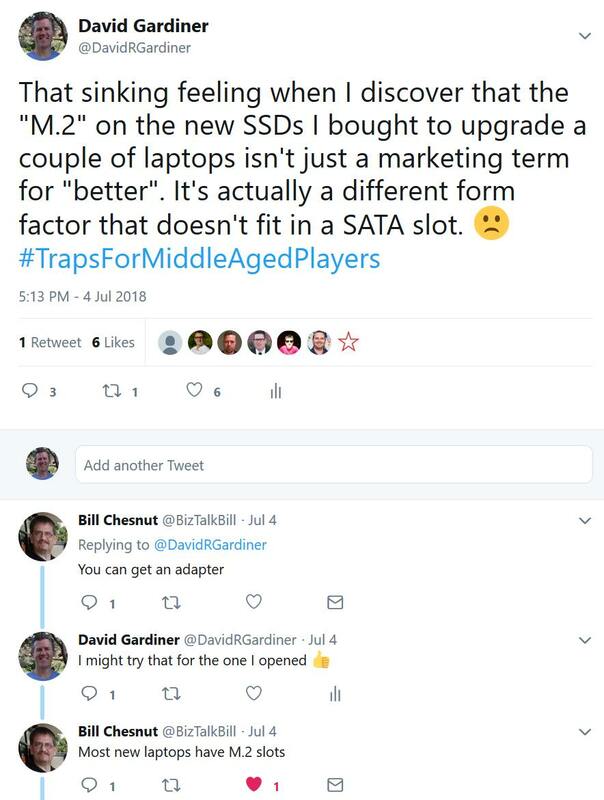 I'd ordered some larger SSDs from MATS Systems this week to upgrade a couple of laptops that were running out of room. I'd scanned through the list and saw Samsung EVO 500GB. Yep, "add to cart" x 2. Job done (or so I thought). 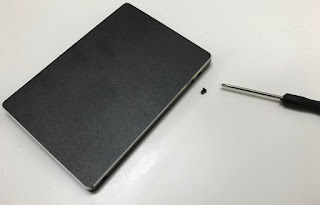 They arrived promptly yesterday, and near the end of the day I disassembled the first laptop to extract the existing smaller-capacity SSD so I could put it in the disk duplicator. 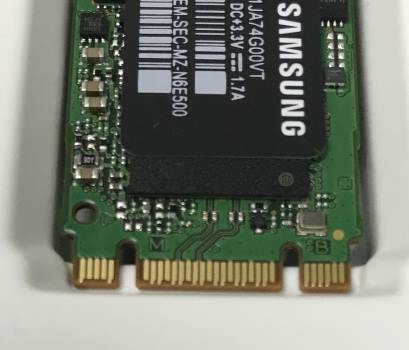 I then ripped open the box of the newly purchased Samsung SSD and to my horror, it didn't look anything like the old one! "But David", you say, "that's an M.2 SSD!" 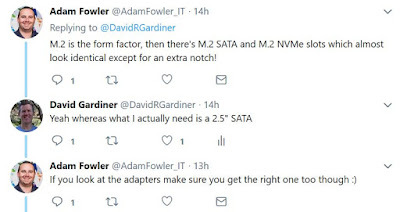 Well yes, yes it is, and that's exactly what it turns out I ordered - not realising that "M.2" doesn't just mean "fast" or "better" but it's an indication of the actual form factor. I now understood that what I should have ordered was the 2.5" model - not the M.2 one. Unfortunately I'd ripped open the box so it wasn't in a great state to return. 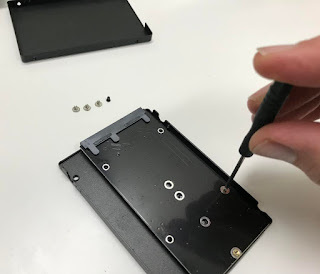 Instead I sourced one of these Simplecom converter enclosures to see if I could use it in the 2.5" laptop slot after all. This is apparently a "B+M" key connector (as it has the two slots). The specs for the Simplecom enclosure say it's suitable for either "B" or "B+M" so I was good there. Unpacking the enclosure, there's a tiny screw one one side to undo, then you can pry open the cover. 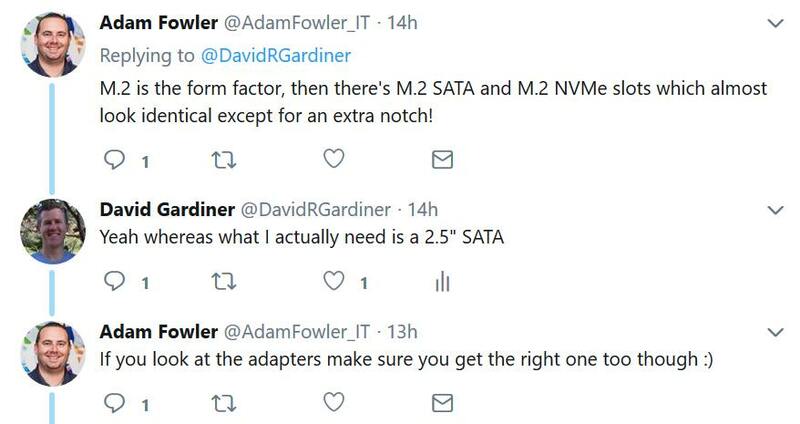 Now it's just a simple matter of sliding in the SSD and using the supplied screw to keep it in. Then reassemble the enclosure and it's ready to test. Then pop the new SSD back in the laptop and see if it boots up.. Yay, it did! 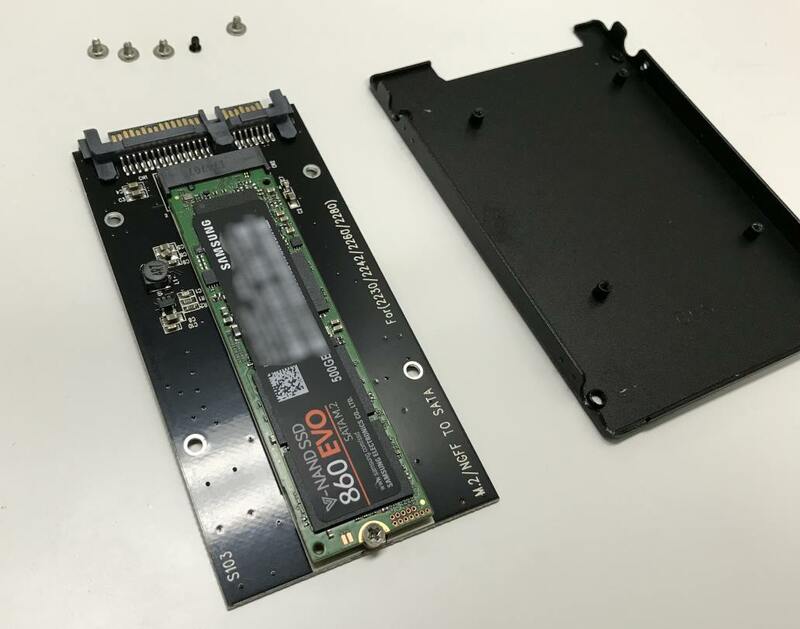 The great news is MATS were able to arrange to swap over the other SSD (the one I hadn't opened yet) with a proper EVO 860 2.5" model. And I learned that if I had been more careful opening the box on the first one, that probably could have been swapped with just a small restocking fee too. I first received Microsoft's MVP award in October 2015. My most recent renewal just occurred on July 1st (aka the early hours of July 2nd here in Adelaide), which was a really nice way to start the week. My 4th consecutive year of being an MVP. To quote the confirmation email, it was given "in recognition of your exceptional technical community leadership. We appreciate your outstanding contributions in the following technical communities during the past year: Visual Studio and Development Technologies"
For me, that's leading the Adelaide .NET User Group, occasional blogging here, speaking at user groups (and the odd conference) and open source contributions. I like to think that the things I do that have been recognised are things that I would be trying to do in any case. It isn't something I take for granted. A number of MVPs I know didn't make the cut this year - and it's always a bit of a mystery why some continue and some don't. I'm also aware that should my own (or Microsoft's) priorities change in the future, then it may no longer be for me. But for now, I really appreciate receiving the award and hope I can make the most of the opportunities it gives me.